The principles to create an effective conflict resolution system for your business or organization. Mediate2go.com, Build an effective conflict resolution strategy for your business or organization! Here are some other benefits of conflict resolution, if conflict is effectively addressed in organizations. 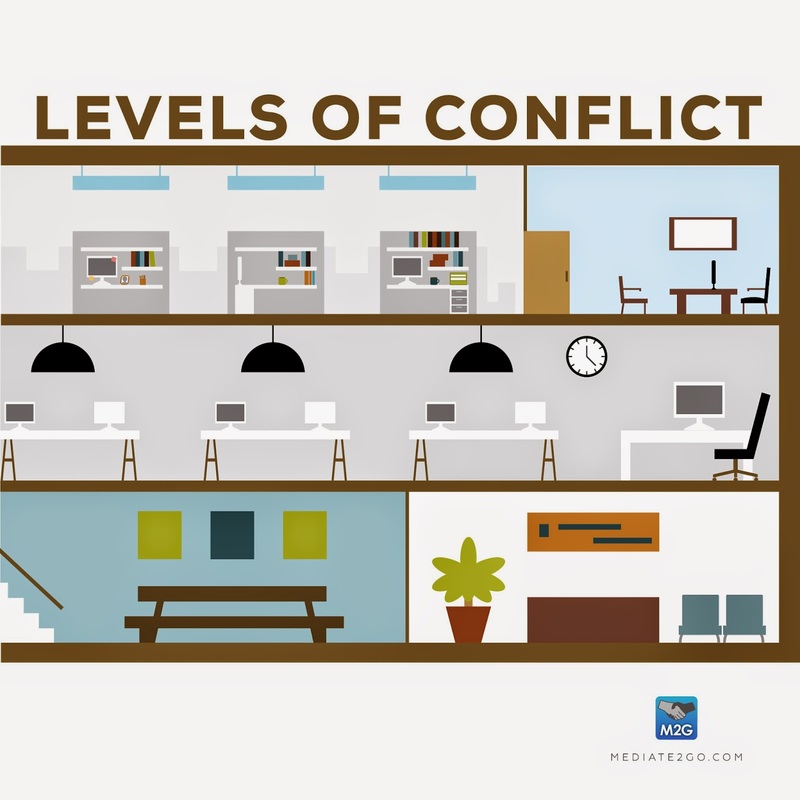 Also, see our blog about how conflict is good for business. Mediation services and conflict coaching can increase creativity, improve performance, collaboration (in relationships and inter-departmentally), heal and restore relationships, manage power imbalances, etc. Also, be sure to see our blog on how conflict can be used to decrease business risk and promote growth within an organization. So, what can you do to transform conflict into a good thing in your company or organization? 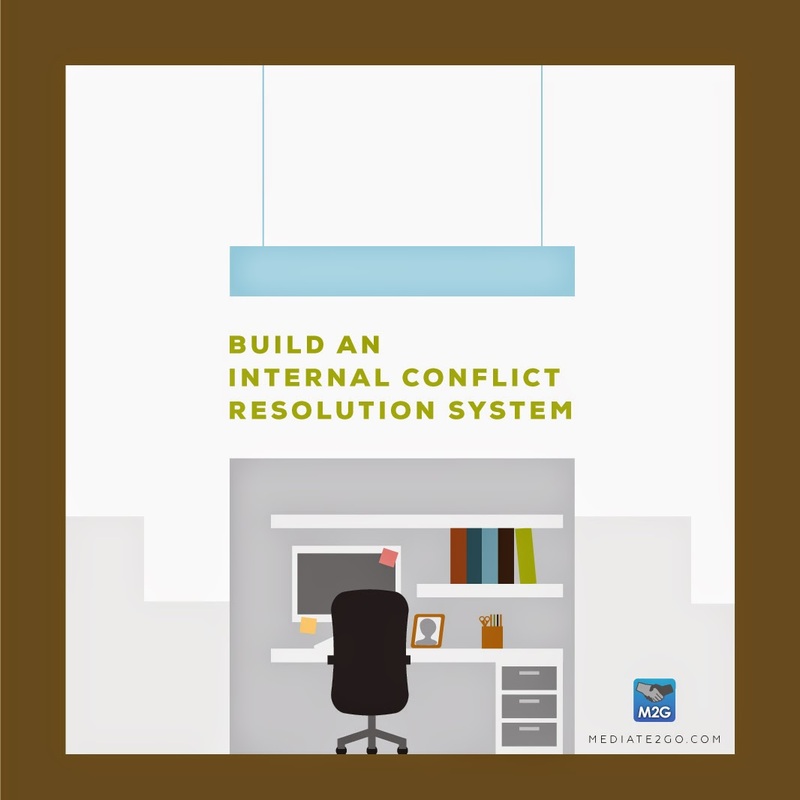 Set up an internal conflict resolution system for your organization or business. Here are some tasks and/or principles to keep in mind when developing a system. 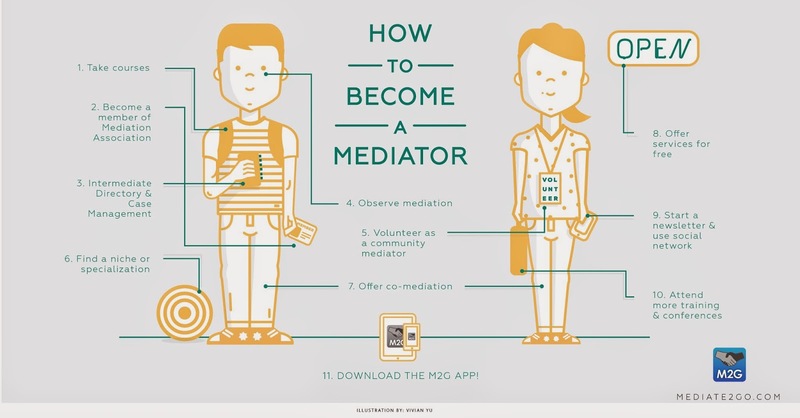 Mediate2go.com, Build an effective conflict resolution system for your business or organization! Customization. Customize the system based on organizational and ‘people’ needs. Self-responsibility. Everyone must take responsibility for their own behaviour and needs. If you have a problem, address it, do not avoid it, unless you believe you can let it go or it will help you resolve the issue in the long run. If something was said that bothered you, find out how to address it effectively. Read about having a constructive confrontation (or discussion) and how to take self-leadership and self-responsibility in conflict resolution. Build Team Cohesion and Trust. Ensure that you encourage all employees and managers to build personal relationships, and integrate this into a weekly agenda of activities. When things do become challenging, individuals will be more likely to have enough Trust to manage these challenges effectively. Trust will also be essential when planning, designing and delivering a program. See our blog on the Definition of Trust and Building Trust. Participation: Ask for the participation of all stakeholders prior to the development of a plan for the organization. Problem Solving. Encourage interdisciplinary and interdepartmental problem solving (levels of conflict). If employees and managers are given the opportunity to share concerns and brainstorm on how to resolve conflicts, the organization is more likely to gather critical data to prevent issues from hurting the organization overall. See our blog on the levels of conflict within an organization. Listening and Feedback Training. Encourage active listening and how to give and receive feedback. If employees and managers are able to effectively listen to one another, they will be empowered to self-resolve many of their issues, often without the help of management and HR. This means more time spent on critical issues. Never underestimate the power of active listening. Meta-communication. Make it part of your weekly routine to talk about how you communicate, how to improve interpersonal relationships, and how to address potential conflict situations (Top 10 Tips on How to Resolve Conflict). Self-resolve Conflicts. In addition to training on interpersonal communication, employees and managers must be given the skills to deal with conflict before it becomes an issue. It might entail other types of training or services, such as those related to stress reduction, whereby these might improve one’s ability to better address personal issues that might lead to conflict. It might also encourage activities such as meditation and yoga in the workplace, to help people feel centered and capable of addressing issues in a healthy way. This is also covered in our blog on self-responsibility, managing anger and our self-resolution tool. Change Agent. Find a mediator, conflict coach and project manager to design, build and implement your conflict resolution system. Be sure to find a mediator with years of experience in workplace conflict resolution to assist in this process. We’ve discussed some of the essential tasks and principles to keep in mind when setting up an internal conflict resolution system. However, they will be able to do a needs assessment to determine the needs of the organization, and recommend how these may be achieved. 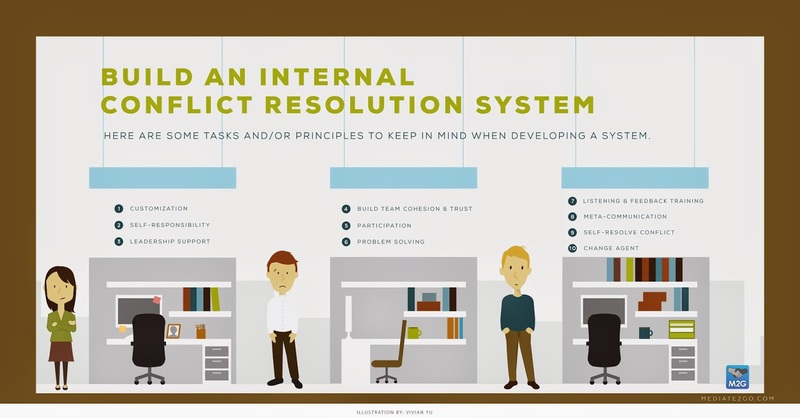 Build an Internal Conflict Resolution System and Strategy: Sign up for Free! In summary, conflict can be used as a positive force of change in your company or organization if it is addressed effectively. Leave your recommendations and questions on the blog in the comments section below. Also, try using our web app to set up your own system.